An arched entrance point has been a historically popular architectural design for centuries. Because of this, Value Doors UK ensures their team of installers are experienced in fitting Arched French Doors, giving you peace of mind that your installation is in capable hands. Two of the most popular arched frame designs are the traditional arch frame and the arched key hole frame. 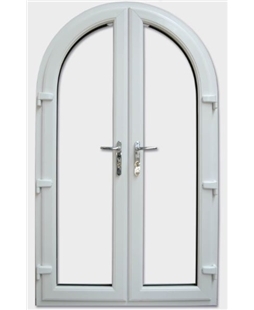 Both come with our British produced uPVC French Doors and the frame is made from 70mm thick, virgin PVC. Please click 'read more' to find out these designs. uPVC French Doors for your rear entrance make a functional aspect of your house a talking point for neighbours and visitors alike. The additional natural light they bring into the house during the warmer months does not come at the cost of thermal efficiency. 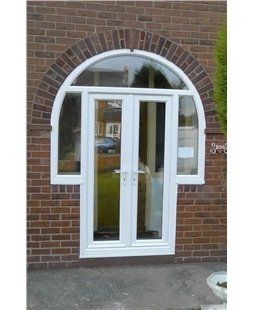 French doors installed within an arch frame are a beautiful, value adding feature to your property. offer, you’ll spend more and more time in your dining room, basking in the sunshine. 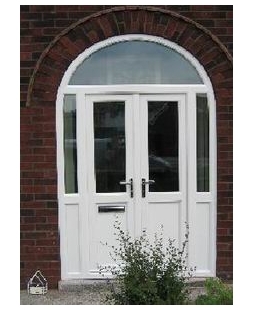 Our arch keyhole frames are made of 70mm thick, high grade uPVC.